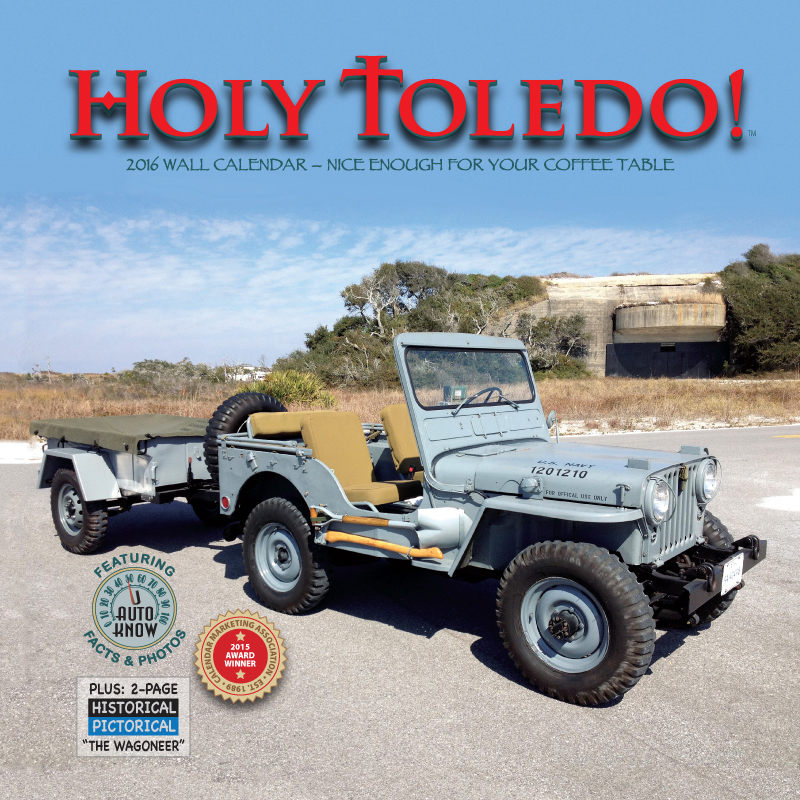 This year might be the year that readers of CJ3B.info will want to take advantage of the offer of free shipping with the purchase of all three of the wall calendars published by Norris-Banonis: Holy Toledo! , Classic Fire Apparatus , and Broken Down Heroes . Colonie Fire Company 407 is a CJ-7 mini-pumper in New York. Richard Kimball's 1962 FC-170 Forward Control Pumper is in Ohio. And a rare 1963 Howe J-200 Gladiator from Pennsylvania is now at Willys America in California. 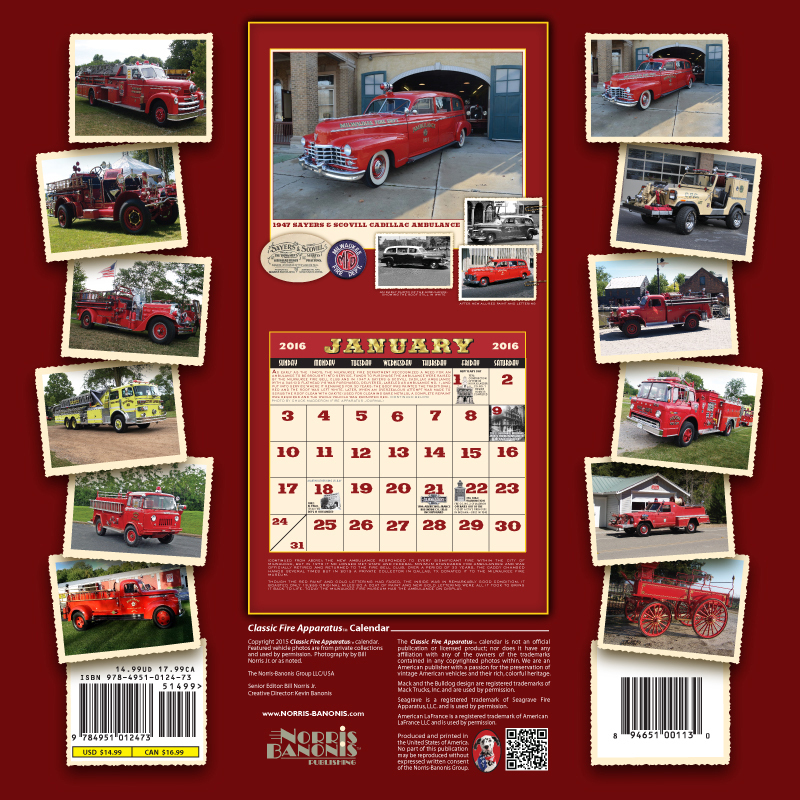 Classic Fire Apparatus is packed with information and memorabilia, just like the Holy Toledo! calendar many of us are familiar with. 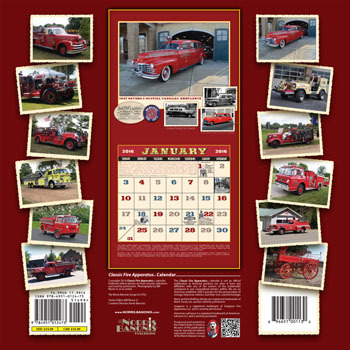 In fact, both of these Norris-Banonis publications, as well as Bob Christy's black & white photography in Broken Down Heroes , were honored by the Calendar Marketing Association's 2015 national awards. This year's Holy Toledo! 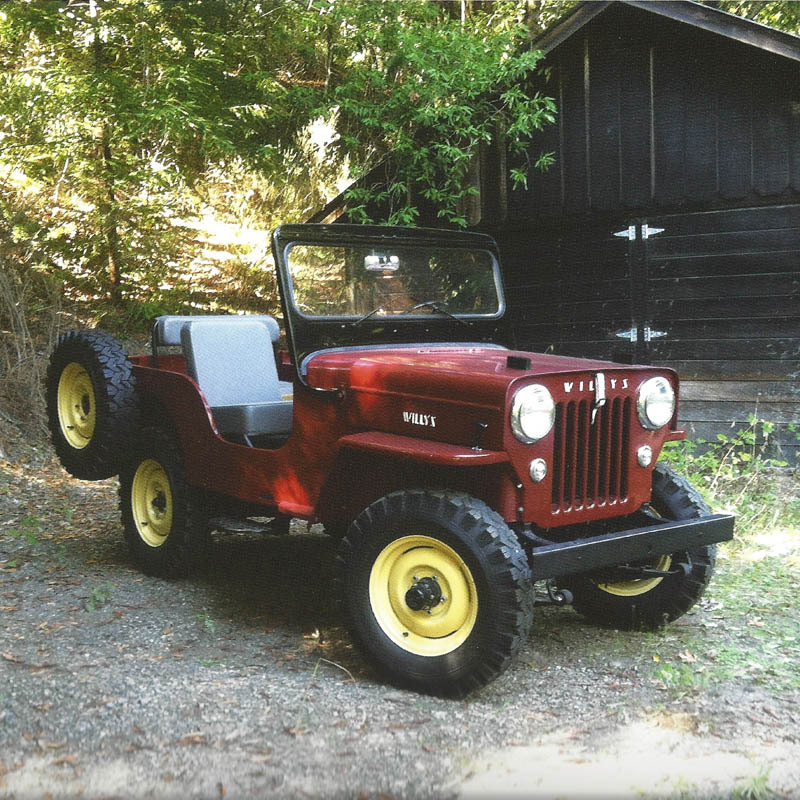 calendar leads off with a cherry red CJ-3B for January. 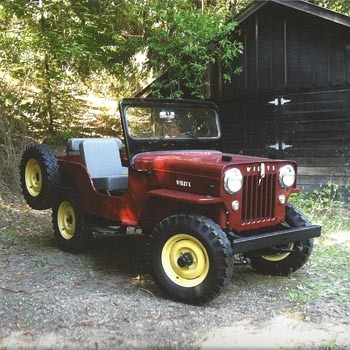 This Jeep, which is appearing here for the first time on CJ3B.info, belongs to Curtis Baker, who also took the photo. It's a great way to start the year, which goes on to include Jim Sullivan's blue Dispatcher and Bruce Agan's blue Surrey, an FC-150, a couple of MB's, a couple of pickups, and a Jeepster with a unique history. All the Holy Toledo! Jeeps are on the back cover. The November/December combo is a really interesting pairing of Bruce Rice's 1963 Wagoneer in Sierra Blue, and Lindsay Clarke's 1963 Utility Wagon, in two-tone President Red with White Cap white. It's always hard to believe the good old wagon and the all-new Wagoneer, the biggest leap that Jeep had ever taken, were both being produced in the same year. Seeing these two like-new examples in consecutive months will take you on a time trip. 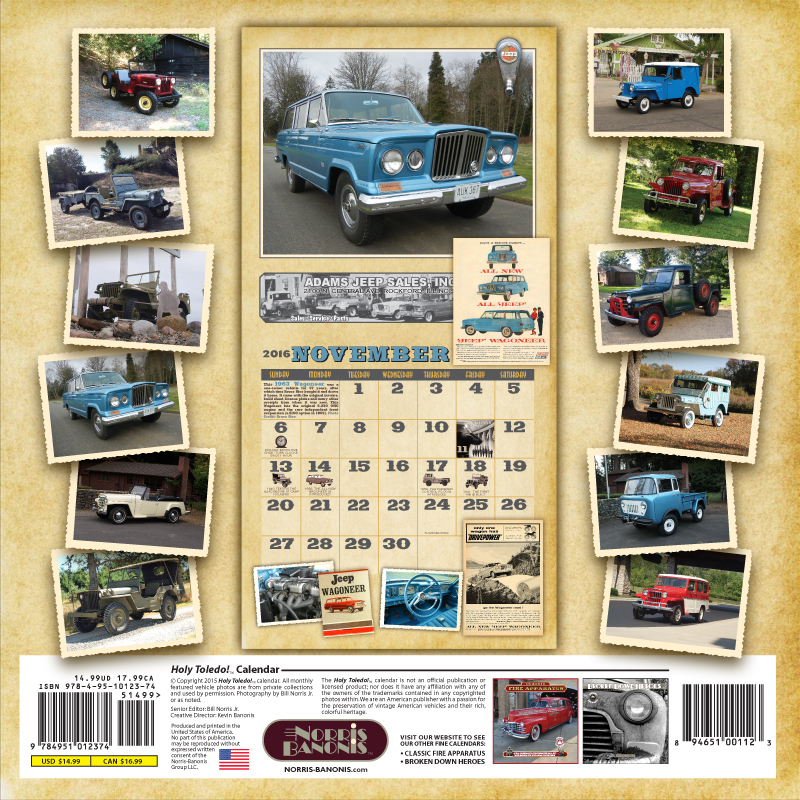 And this year's bonus "Historical Pictorical" at the end of the calendar, is an excellent history of the 1963-91 Jeep Wagoneer. 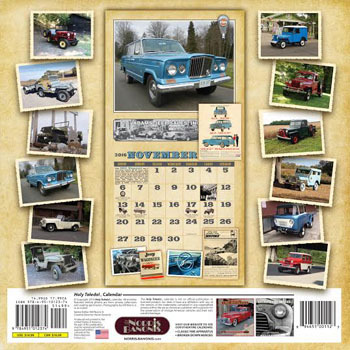 The front cover photo is an M38 restored as a Navy Jeep, and it's a different picture from the one that's featured on the July page inside; you really get your money's worth with this calendar. Meanwhile, the 2016 edition of Broken Down Heroes is again 12 months of Bob Christy's beautiful black & white portraits of abandoned old vehicles. There are always surprises in this one, and this year there is a Jeep surprise. See more Advertising and Literature on CJ3B.info.